Saddleback Mountain, one of Maine largest resorts, is located in the heart of Rangeley Lakes Region. Imagine yourself gliding down a snowy hill, powder flying as you swoosh almost silently through untouched forest on either side. For an adventure-packed vacation on the slopes, Maine’s ski and snowboarding areas can’t be beat. Whether you prefer skiing or riding, Maine’s world-class mountains provide the venue. Maine’s ski resorts offer trails and terrain for all abilities, from beginning snow plowers to expert carvers. With 17 ski areas to choose from, winter sports enthusiasts can enjoy the state’s quick lifts, abundant snow, short lines and mountain views that make up the best skiing and riding in New England. Together, Maine’s ski areas offer more than 575 trails — with massive vertical drops of up to 2,800 feet — across thousands of skiable acres. Many coastal ski areas provide stunning ocean vistas, while inland resorts offer alpine-style trails above the tree line. And, though the average annual snowfall varies widely across the state — from 240 inches at Sugarloaf in the Carrabassat Valley to 75 inches at Mt. Jefferson Ski Area near Lee — many resorts add to the natural bounty of white stuff with state-of-the-art snowmaking equipment. Maine’s ski season generally runs from late November through March, though larger or higher-elevation resorts with snowmaking capacity may open as early as mid-November and offer spring skiing through early May. Snow levels and climate conditions vary by region. Maine’s southernmost region, the Maine Beaches, is home to Powderhouse Hill. Established in 1939, this ski area near South Berwick is open Wednesday through Sunday and costs only a few dollars. Perfect for families or beginning skiers and boarders, this classic Maine ski area features a vertical drop of 150 feet, three trails and an old-fashioned ski lodge with a wood stove. Further inland, the Maine Lakes and Mountains region is home to 8 ski areas. 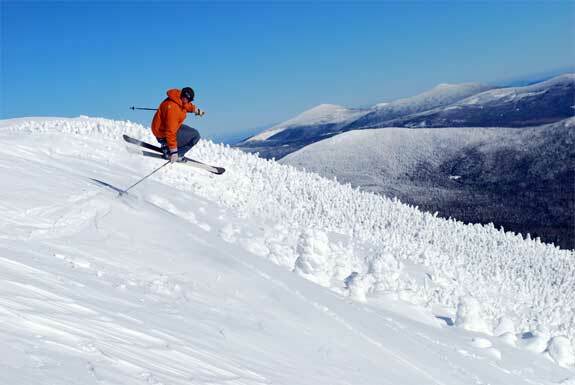 Sugarloaf, the largest ski area east of the Rockies, offers a 2,820-foot vertical drop and 54 miles of trails. With three terrain parks, several double black diamond runs, a ski school and a rental shop, Sugarloaf is a popular winter destination for skiers and riders of all abilities. The Sunday River Resort near Newry has a vertical drop of 2,340 feet – the second largest in the state — and 16 lifts. With more than 742 skiable acres and two on-site hotels, Sunday River’s 133 trails offer something for all abilities as well as a ski school, lodges and rental shop. Also among the largest, Saddleback Maine in the scenic Rangeley Lakes region. This ski area honors the area’s long fly-fishing heritage; all 66 trails and five lifts are named for famous fly designs and fishing rivers. With an elevation over 4,000 feet and a vertical drop of 2,000 feet, Saddleback offers terrain ranging from blue circle to double black diamond. The resort also has a ski and ride school and a rental shop. Titcomb Mountain near West Farmington is open all day on the weekends and offers night skiing on weekdays. With a top elevation of 750 feet, a vertical drop of 350 feet and 16 trails and a terrain park, Titcomb caters to all abilities. The resort, which was established in 1939, also offers ski lessons and rentals. The Lost Valley Ski Area near Auburn opened in 1961. It’s founder, Otto Wallingford, created the first snowmaker in Maine and also introduced a powder-creating grooming system to the state. Today, Lost Valley Ski Area has two lifts, a vertical drop of 240 feet and 245 skiable acres. Trails range from beginner to advanced level; boarders can play on the terrain park. Lost Valley also has a lodge with a rental shop. In the Maine Highlands region, the Mt. Jefferson Ski Area offers a family-friendly winter sports experience. With a vertical drop of 432 feet, a tow and two lifts, this family-owned ski area is easily accessible. It offers a snack bar, ski school and rental shop. Just a few miles from Bangor, Hermon Mountain has two chair lifts and a t-bar tow that take skiers and boarders to the top of its six trails. It’s open for day skiing every day of the week and offers night skiing Monday through Saturday. Hermon Mountain also offers a limited schedule of ski and snowboard classes as well as a rental and repair shop. On Maine’s Mid-Coast, the Camden Snow Bowl offers spectacular ocean views from its slopes. Just 4.5 miles from stunning Camden Harbor, this historic ski area first opened in 1936 in the midst of the Great Depression as part of a Works Progress Administration-funded project. Today, this coastal resort on 1300 foot tall Ragged Mountain offers an 850 foot vertical drop and ten trails on 90 skiable acres. With four lifts and a terrain park, Camden Snow Bowl has a ski and snowboard school for beginners as well as a number of black diamond trails for advanced riders. Eaton Mountain Ski and Campground nestles in the Kennebec and Moose River Valleys region near Skohegan. This family-owned ski hill has two lifts and 12 runs for beginning through advanced riders. With a vertical drop of 525 feet, this small resort offers six lighted runs for night skiing and a lodge with a woodstove and a snack bar. Baker Mountain, located in Bingham, is a small ski area with one T-bar. It is run by its pass holders who volunteer their time. Maine’s largest and northernmost region, Aroostook County, is home to Big Rock in Mars Hill. Operated by the Maine Winter Sports Association, this ski area has almost 1,000 feet of vertical drop and 26 trails served by two lifts. Most trails are appropriate for intermediate or advanced skiers. Big Rock also offers a ski and snowboard school as well as a number of ski and stay packages at local hotels and lodges. If you want to learn more about Maine’s rich winter sports heritage, stop by the Ski Museum of Maine. Located in Kingfield, this museum features photos, exhibits and interactive displays that bring skiing’s long history in Maine to life. If you’re lucky, you may even catch a round of the Maine Mountain Series, an annual freeski and snowboard competition that leads talented athletes on to the Olympics, World Cup and X Games events. Sugarloaf also hosts the Revolution Tour, the top junior boarding tour in the U.S. Other Maine events include the Visa U.S. World Snowboarding Cup and the Dumont Cup. Add some excitement to your winter with a ski or snowboard vacation in Maine this winter. But before you hit the slopes, visit the Ski Maine Association’s website for the latest snow and trail reports. Happy trails!